Having spent the last few years being connected to Jini, her remarkable artistry and life story, there are many beautiful memories to sift through. But when Jini died on July 3rd,at the grand age of 97, what filled my heart and soul was Jini’s beaming smile and warm greetings to the audience at the sold out world premiere screening of Her Aim Is True at Seattle International Film Festival last spring. In those moments, Jini’s grace, elegance, charm, and gentle nature just shined through. About three years previously, I had met Jini for dinner in her Seattle home. I mistakenly thought it was I that was going to be doing the “interviewing”, (to find out if she would be open to being a documentary subject herself.) Of course, like countless subjects of her lens decades before, we ended up just hanging out and having a wonderful conversation as old friends might. Jini talked to me with intense interest about what motivated my journey in the arts, filmmaking, my family background and life. In those few hours a bond was made that became a much stronger connection than I can ever put into words. But I am not alone. Jini’s capacity to love and care for those she meets is as legendary as her archive. I saw these traits again and again during our filming. Jini filled each shoot day with plenty of grace and charm, wit and broad smiles. I think it is pretty bold to accept a documentary film crew into your life aged 93, and agree, as well, to take on the latest in digital photo technology to do a rock band photo shoot, about 50 years on from your last period of rock n’ roll photography. But that is Jini all over. She never said no and she did not follow rules, but marched to her own drum, so she took on every creative challenge and opportunity with a fearless quality. Her approach from the day she left school aged 17 to pursue a career playing jazz saxophone in all girl jazz bands of the 1930s, to the day aged 92 when she said “yes” to making the documentary, was always characterized by “why not try”. 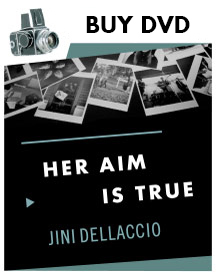 All in all, Jini Dellaccio was not your traditional image of a rock and roll photographer and maybe that has a lot to do with the innovative and beautiful images she was able to create and why her life story is so enduring and relevant today. I now like to imagine people saying – “well, what would Jini do?” She would always say YES, often defying convention and her “age” to take any risk for creativity, and be generous in her artistry. In both music and photography, Jini’s human warmth and artistry were totally in sync, as they were evident in everything she did. Her Aim Is True has screened worldwide since its release in 2014. It is available for streaming on multiple platforms including Itunes & Amazon Prime, Hulu, Google Youtube & Comcast Streampix..